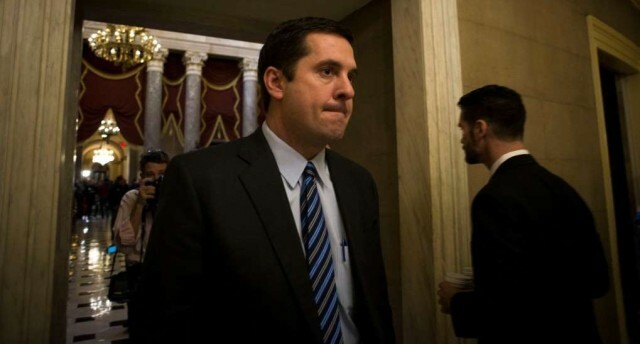 Calls grow for House Intelligence Committee chairman Devin Nunes to step aside from the Trump-Russia inquiry, amid more evidence of his collaboration with the White House. On Monday, it was revealed that Nunes met on the White House grounds with a source who showed him secret American intelligence reports. The next day he briefed Donald Trump and/or his closest associates that Trump associates may have been “incidentally” swept up in surveillance of Russian officials by US agencies. Nunes never consulted with committee members about his actions. Last week’s meeting at the White House led Trump — who has made unsupported allegations that Trump was wiretapped by President Obama in summer 2016 — to declare that he had been “vindicated”. Nunes, a member of the Trump transition team after the November election, subsequently issued a limited apology for the briefing. Sean Spicer, the White House Press Secretary, insisted on Monday that White House officials had no previous knowledge of Nunes’s visit and that they were “not concerned” about the prospect that someone within the Executive leaked classified information to the committee chairman. Attorney General Jeff Sessions presses for an end to sanctuary cities providing shelter for undocumented immigrants. Sessions said he is “urging states and local jurisdictions to comply with these federal laws”, under which the Trump Administration has cracked down with the detention and deportation of hundreds of immigrants. He said the Justice Department will require compliance with immigration laws for the cities to receive grants through the Office of Justice Programs. The Obama administration had a similar policy in place. Trump said during the campaign that he would defund sanctuary cities, which include New York, Chicago, Los Angeles, and Austin, Texas. Donald Trump overturns two Obama-era education regulations. Trump abandoned new requirements for programs that train new teachers from kindergarten to high school and rolled back the mandate for states to carry out the Every Student Succeeds Act, a bipartisan federal law holding schools accountable for student performance. Trump said he was “removing an additional layer of bureaucracy to encourage freedom in our schools”. Proponents of the rules said they prevent loopholes for states to shield poorly performing schools from scrutiny, especially when they fail to serve poor children, minorities, English-language learners, and students with disabilities. The measure to repeal the regulations passed easily in House of Republicans, but was only passed 50-49 in the Senate in a vote mostly along party lines. Donald Trump cancels the “Fair Pay and Safe Workplaces” rule, barring companies from receiving federal contracts if they had a history of violating wage, labor, or workplace safety laws. President Obama had adopted the rule through an executive order in 2014. Trump also overturned a Bureau of Land Management rule that gave the federal government a bigger role in land use decisions. The rule was opposed by the energy industry. Trump has now signed a total of seven executive orders lifting federal regulations under the Congressional Review Act. Before this year, only one regulation had been removed by the Act since its adoption in 1996. Russian billionaire Oleg Deripaska denies working in 2005 with Paul Manafort, campaign manager for Donald Trump from March to August 2016, on a plan to benefit Vladimir Putin. Manafort signed a $10 million annual contract beginning in 2006, according to interviews with several people “familiar with payments” and business records obtained by the AP. Manafort and Deripaska maintained a business relationship until at least 2009, according to one source. NextSyria Daily: Is Taqba Dam in Danger of Collapse After US Airstrikes?